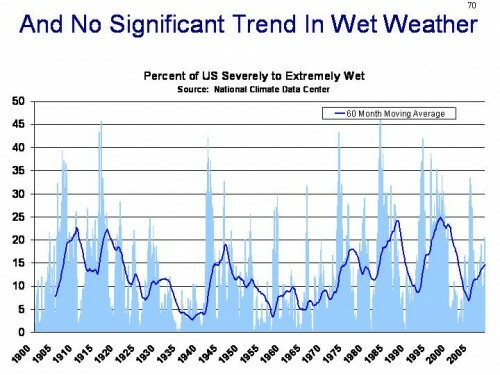 It has been a tenet of the UN’s “authoritative consensus” that global warming will cause more extremes in weather such as dry areas becoming drier and wet areas becoming wetter. 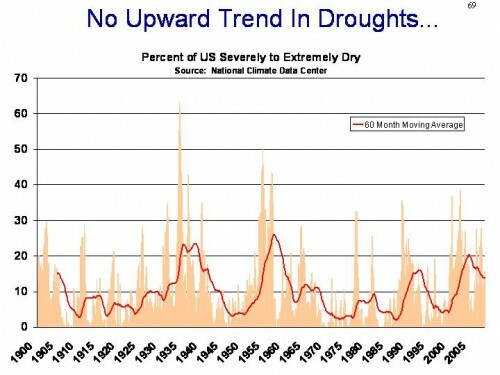 (Amazing, isn’t it how global warming can cause both drought and extreme rainfall?) Alas, a new study compared the rainfall/drought conditions of the 20th Century to the past 1,200 years in the Northern Hemisphere and found that extremes of rainfall and drought were much more prevalent in both warmer and cooler periods of the past. The study was based upon geologically preserved evidence of stream flow, lake levels, marine and lake sediments, tree rings, and historical records. Could it be that something other than CO2 and temperature is causing these conditions? Accurate modeling and prediction of the local to continental-scale hydroclimate response to global warming is essential given the strong impact of hydroclimate on ecosystem functioning, crop yields, water resources, and economic security. However, uncertainty in hydroclimate projections remains large, in part due to the short length of instrumental measurements available with which to assess climate models. Here we present a spatial reconstruction of hydroclimate variability over the past twelve centuries across the Northern Hemisphere derived from a network of 196 at least millennium-long proxy records. We use this reconstruction to place recent hydrological changes and future precipitation scenarios in a long-term context of spatially resolved and temporally persistent hydroclimate patterns. We find a larger percentage of land area with relatively wetter conditions in the ninth to eleventh and the twentieth centuries, whereas drier conditions are more widespread between the twelfth and nineteenth centuries. Our reconstruction reveals that prominent seesaw patterns of alternating moisture regimes observed in instrumental data across the Mediterranean, western USA, and China have operated consistently over the past twelve centuries. Using an updated compilation of 128 temperature proxy records, we assess the relationship between the reconstructed centennial-scale Northern Hemisphere hydroclimate and temperature variability. Even though dry and wet conditions occurred over extensive areas under both warm and cold climate regimes, a statistically significant co-variability of hydroclimate and temperature is evident for particular regions. We compare the reconstructed hydroclimate anomalies with coupled atmosphere–ocean general circulation model simulations and find reasonable agreement during pre-industrial times. However, the intensification of the twentieth-century-mean hydroclimate anomalies in the simulations, as compared to previous centuries, is not supported by our new multi-proxy reconstruction. This finding suggests that much work remains before we can model hydroclimate variability accurately, and highlights the importance of using palaeoclimate data to place recent and predicted hydroclimate changes in a millennium-long context. These results should not be a surprise to those who deal with real data rather than output of computer models. By the way: The frequency of 90 degree days and 100 degree days has plummeted across most of the US since the 1930’s, see graphs. Posted in Climate change and tagged Climate change, extreme weather, global warming, models on April 16, 2016 by wryheat2. Dr. Judith Curry, Professor and former Chair of the School of Earth and Atmospheric Sciences at the Georgia Institute of Technology, has introduced a new book by Alan Longhurst titled Doubt and Certainty in Climate Science. You can read Curry’s extensive remarks here. The author, Alan Longhurst, is a biological oceanographer at the Bedford Institute of Oceanography in Dartmouth, Nova Scotia, Canada. He has published more than 80 peer-reviewed papers and several books. You can download the book as a PDF file for free (4.4Mb). While I am aware that the general opinion of the relevant scientific community is that no further debate is necessary after five successive assessments by the IPCC, I suggest that this is premature because these conclusions concern topics that have not yet been properly addressed by that body, and so should be accorded status in a continuing debate concerning the influence of anthropogenic effects on regional climates. • — the global archives of surface air temperature measurements are unreliable estimators of the consequences of atmospheric CO2 contamination, because they are already themselves contaminated by the effects of deforestation, land use change, urbanization and the release of industrial particulates into the lower atmosphere. • — users of these data are not able to judge the consequences of the adjustments that have been made to the original observations of surface air temperature ashore, although the limited investigations now possible show that the adjustments have changed the long-term trends that had been recorded by some reputable national meteorological services. • — sea surface temperature is not a substitute for air temperature over the oceans because it responds to changes in vertical motion in the ocean associated with coastal and open-ocean upwelling; the resultant change in surface temperature is independent of any changes in atmospheric temperature caused by CO2, yet these changes are integrated into the GMST record which is used to estimate the effects of CO2. • — surface air temperatures respond to cyclical changes within the Sun, and to the effect of changing orbital configurations in the solar system: the changes in the resultant strength of received irradiance (and of tidal stress in the oceans, which also has consequences for SAT) are both predictable and observable. • — our description of the evolution of the global heat budget and its distribution in multiple sinks is inadequate for an understanding of the present state of the Earth’s surface temperature, or to serve as the initial state for complex modeling of climate dynamics. Future states are therefore unpredictable, cannot be modeled, and will certainly surprise people living through the next century. • — the planetary heat budget is poorly constrained, perhaps principally by our inability to quantify the mechanisms that control the accumulation and loss of heat in the ocean, where most solar heat accumulates; the quantification of changes in cloud cover is so insecure that we cannot confidently describe its variability, yet clouds are the most important control on the rate of heat input at the sea surface. • — the evidence for an intensification of extreme weather events and, in particular, tropical cyclones is very weak and is largely due to the progressively increasing reliability and coverage of weather monitoring: today’s frequency of cyclones and other phenomena does not appear to be anomalous when longer data sets can be examined. • — global climate in the present configuration of the continents falls naturally into a limited number of patterns that are forced externally and patterned by internal dynamics. Some of these climate patterns will tend to conserve global heat, some will tend to permit its dissipation to space, while all move heat from one region to another. Two dominate the whole: the North Atlantic Oscillation that describes the flux of tropical heat through the North Atlantic Current into Arctic regions, and the Southern Oscillation that describes the strength of trade winds, especially in the Pacific, and thus the relative area of cold, up-welled water that is exposed to the atmosphere. • — the recent melting of arctic ice cover over larger areas than 20 years ago in summer is not a unique event, but is a recurrence of past episodes and is the result of cyclically-variable transport of heat in warm North Atlantic water into the Arctic basin through the Norwegian Sea; the present episode will likely evolve in the same way as earlier episodes. • — sea level is indeed rising as described by the IPCC and others, but the causes, especially at regional scale,are more complex than suggested by that agency and involve many processes other than expansion due to warming. Had the human population of some very small islands remained within carrying capacity, their occupation could have been permanent, but this is not the case. • — the consequences of acidification of seawater is one of the most enigmatic questions, and may bring serious biological problems, although it seems now that (i) marine organisms are more resilient to changing pH than was originally feared, because of the genetic diversity of their populations and (ii) the history of pH of seawater during geological time suggests that resilience through selection of genomes has emerged when appropriate in the past (Sections 10.3, 10.4). Unfortunately, the essential debate on these issues will not take place, at least not openly and without prejudice, because so many voices are today saying – nay, shouting ‘enough, the science is settled, it is time for remediation’. In fact, many have been saying this for almost 20 years, even as fewer voices have been heard in the opposite sense. As discussed in Chapter 1, the science of climate change like many other complex fields in the earth sciences does not function so that at some point in time one can say “now, the science is settled”: there are always uncertainties and alternative explanations for observations. Posted in Book Reviews, Climate change and tagged Climate change, extreme weather, global warming, uncertainty on September 21, 2015 by wryheat2. This makes for ominous headlines that will get some press. However, had the researchers gone farther into the past, they would have found that extreme drought and low snow pack conditions were more common, and all due to natural variation of the climate. Multiple proxies, including tree rings, sediments, historical documents and lake sediment records make it clear that the past 2 kyr [2,000 years] included periods with more frequent, longer and/or geographically more extensive droughts in North America than during the 20th century. Past droughts, including decadal-length ‘megadroughts’, are most likely due to extended periods of anomalous SST [sea surface temperature], but remain difficult to simulate with coupled ocean-atmosphere models. Thus, the palaeoclimatic record suggests that multi-year, decadal and even centennial-scale drier periods are likely to remain a feature of future North American climate, particularly in the area west of the Mississippi River. There is some evidence that North American drought was more regionally extensive, severe and frequent during past intervals that were characterised by warmer than average NH summer temperatures (e.g., during medieval times and the mid-Holocene). There is evidence that changes in the North American hydrologic regime can occur abruptly relative to the rate of change in climate forcing and duration of the subsequent climate regime. Abrupt shifts in drought frequency and duration have been found in palaeohydrologic records from western North America. Similarly, the upper Mississippi River Basin and elsewhere have seen abrupt shifts in the frequency and size of the largest flood events. Recent investigations of past large-hurricane activity in the southeast USA suggest that changes in the regional frequency of large hurricanes can shift abruptly in response to more gradual forcing. Although the paleoclimatic record indicates that hydrologic shifts in drought, floods and tropical storms have occurred abruptly (i.e., within years), this past abrupt change has not been simulated with coupled atmosphere ocean models. Decadal variability of Central Chilean precipitation was greater before the 20th century, with more intense and prolonged dry episodes in the past. Tree-ring based precipitation reconstructions for the past eight centuries reveal multi-year drought episodes in the 14th and 16th to 18th centuries that exceed the estimates of decadal drought during the 20th century. Posted in Climate change and tagged Climate change, extreme weather, global warming, Sierra nevada, snowpack on September 16, 2015 by wryheat2. A new report from the National Oceanic and Atmospheric Administration (NOAA) says they can’t find a link between anthropogenic global warming and weather extremes that occurred in 2013 such as the California drought, Colorado floods, the UK’s exceptionally cold spring, a South Dakota blizzard, Central Europe floods, a northwestern Europe cyclone, and exceptional snowfall in Europe’s Pyrenees Mountains, among other things. 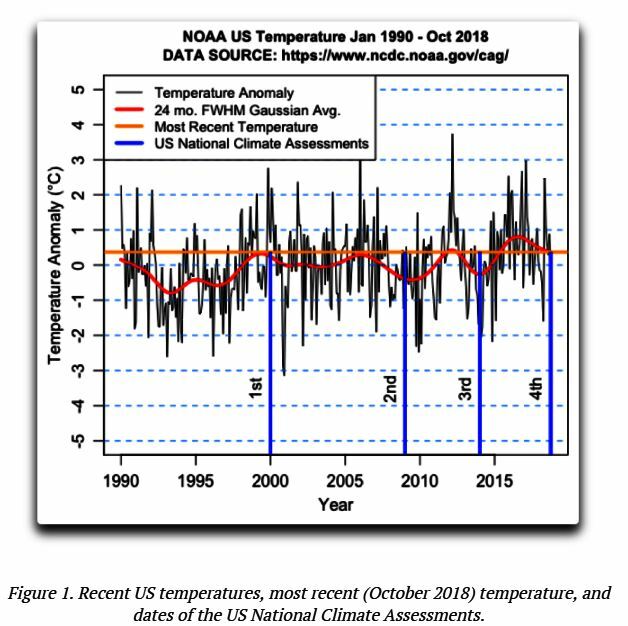 Observational data does not appear to show any trend in the occurrence of heat waves, whatever the cause, and thus provides no physical evidence that global warming is producing weather extremes. Posted in Climate change and tagged Climate change, extreme weather, global warming on October 13, 2014 by wryheat2. 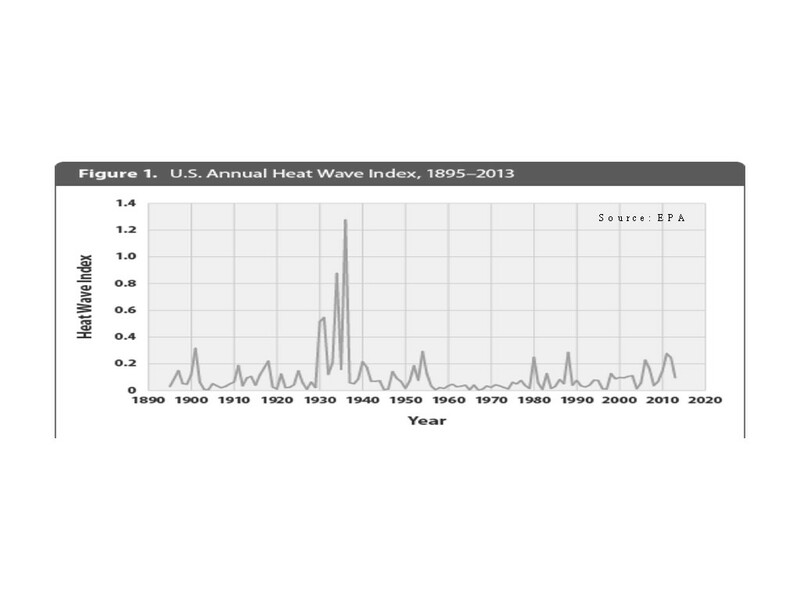 Knappenberger also debunks the NCA claim that heat waves are causing more deaths. The National Climate Assessment claims that effects of global warming are already happening and causing increases in extreme weather events and wildfires. Well, let’s look at the data. Wildfires: Data from the National Interagency Fire Center shows that the number of wildfires has been steadily decreasing since 1960. The number of acres burned, however, has been increasing since about 1995 due in part to changes in forest management under the Endangered Species Act. For more details see Wildfires and Warming. 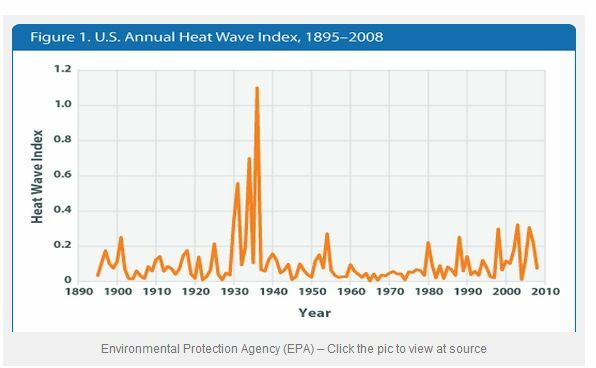 Heatwaves: Looks like the 1930s surpass any we’ve experienced recently. For more data on extreme weather see the WUWT extreme weather page. The National Climate Assessment also worries about sea level rise, although sea level has been rising naturally for the past 18,000 years. The rate of sea level rise is cyclical on decadal and multi-decadal time scales, but overall, the rate is decreasing even as the planet warms, (see Sea Level Rising?). For real, peer-reviewed science, see Climate Change Reconsidered II (CCR-II), an independent, comprehensive, and authoritative report on the current state of climate science. It is produced by the Nongovernmental International Panel on Climate Change (NIPCC), an international network of climate scientists sponsored by three nonprofit organizations: the Science and Environmental Policy Project, Center for the Study of Carbon Dioxide and Global Change, and The Heartland Institute. How well do the NCA assertions compare with real data? As can be seen from the data above, they diverge wildly from real data. The report is filled with wild distortions and outright fabrications. If we apply Feynman’s scientific method (if an assertion disagrees with observations or data, it is wrong) to the NCA report, we can only conclude that the report fails badly. One can only wonder why the so-called scientists who wrote the report could possibly justify making such unsupported assertions contrary to hard data. A substantial part of the report emphasizes weather events (drought, hurricanes, tornadoes, storms, etc). The authors don’t seem to know the difference between weatherand climate. None of the ‘extreme events’ they cite have any meaning whatsoever to climate. Single weather events can happen at any time, regardless of the climate. The authors also don’t seem to be able to distinguish cause-and-effect relationships from artificial scenarios. They frequently point to ‘global warming’ as if that somehow proves it was caused by CO2,totally ignoring vast amounts of data showing that CO2 always lagswarming, even on a short term basis. If CO2 lags warming, it can’t be the cause of the warming! The most obvious shortcoming of the NCA report is all of the assertions that are contrary to hard data. But the report is also weakened by the wholesale ignoring of relevant data. Rather than discussing data and justifying their assertions, the authors simply disregard any data that doesn’t fit their scenarios. From these observations, one can only conclude that the report is really not a scientific document at all, but rather a huge political propaganda effort. Read full post here. Weather and climate are complex. Even with supercomputers, if the wrong assumptions are input, then the results are often wrong. Let’s see how NOAA and the Met Office did with winter forecasts this year. 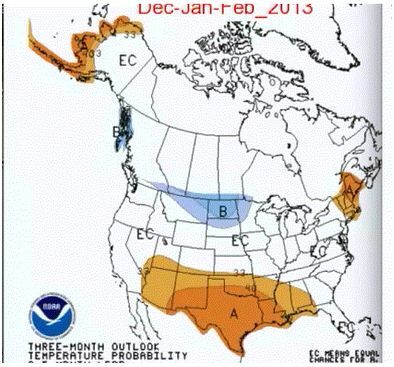 The graphic below was made last fall by NOAA showing their predictions for winter temperatures in the U.S. The orange with an “A” shows areas that NOAA predicted would be above average, the blue with a “B” is for below normal temperatures, and the white area with “EC” are equal changes of being above or below normal. So much for predictions. The conditions that really happened are shown on the graphic below. (Source: NoTricksZone). 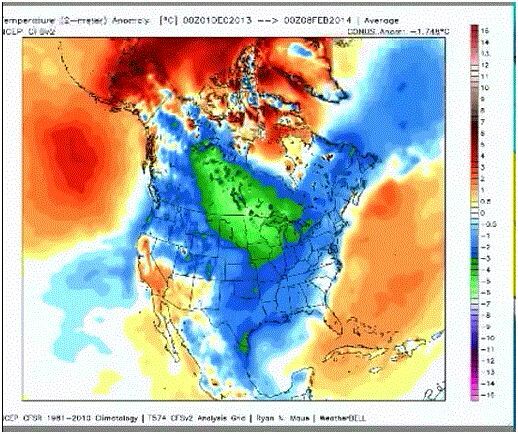 The blue area is colder than normal; green is much colder than normal. Remember, these are the people who claim they can predict climate change 10 to 100 years into the future. Back in November, the British Met Office predicted that this winter would be colder and dryer than normal (Source). However, this winter the UK has had record rainfalls. (Source and here). This year was not the first time that the Met Office got the forecast very wrong. Back in 2012, when they touted their new supercomputer which is capable of 1,000 billion calculations every second, and uses 1.2 megawatts of energy to run – enough to power a small town, the head of the Met Office claimed that this new computer “will enable the Met Office to deliver more accurate forecasts, from hours to a century ahead.” (See my post “British supercomputer botches weather forecasts”) As it turned out, spring in 2012 was one of the wettest on record in the UK. I pick on 2012 because my wife and I happened to be traveling in the UK that June. We rather enjoyed the cool and wet weather as a contrast to an Arizona June which is hot (35-45̊C) and dry. Results show that even with super computers, predicting the weather is a tricky business. Government agencies seem to make assumptions based on political science rather than real science. Perhaps they should consult the Old Farmer’s Almanac more often. That publication claims to get the long-range forecasts right about 80% of the time. Posted in Climate change and tagged extreme weather, Met Office, NOAA, super computer on February 10, 2014 by wryheat2. Climate Change Reconsidered II (CCR-II) is an independent, comprehensive, and authoritative report on the current state of climate science. It is produced by the Nongovernmental International Panel on Climate Change (NIPCC), an international network of climate scientists sponsored by three nonprofit organizations: the Science and Environmental Policy Project, Center for the Study of Carbon Dioxide and Global Change, and The Heartland Institute. CCR-II consists of three parts: a Summary for Policy Makers (22 pages) and CCR-II Physical Science (Ca. 1,018 pages, 20Mb) are available for free download. The third part, titled Impacts, Adaptation, and Vulnerabilities, is expected to be released in March, 2014. Approximately 40 scientists are participating as authors, contributors, or reviewers. Lead authors are Dr. Craig D. Idso, a geologist and founder and current chairman of the Center for the Study of Carbon Dioxide and Global Change; Dr. Robert M. Carter, a marine geologist and environmental scientist and formerly professor and head of the School of Earth Sciences at James Cook University (Australia); and Dr. S. Fred Singer, an atmospheric physicist formerly a professor at the University of Virginia and currently director of the Science and Environmental Policy Project. CCR-II cites more than 1,000 peer-reviewed scientific papers to show that the IPCC has ignored or misinterpreted much of the research that challenges the need for carbon dioxide controls. In other words, the NIPCC report demonstrates that the science being relied upon by governments to create multi-billion dollar policies is almost certainly wrong. What follows are excerpts of the key findings from the Executive Summary (you can read a more extensive list of findings from the executive summary here, about five pages). • Atmospheric carbon dioxide (CO2) is a mild greenhouse gas that exerts a diminishing warming effect as its concentration increases. • Doubling the concentration of atmospheric CO2 from its pre-industrial level, in the absence of other forcings and feedbacks, would likely cause a warming of ~0.3 to 1.1°C, almost 50% of which must already have occurred. • A few tenths of a degree of additional warming, should it occur, would not represent a climate crisis. • Model outputs published in successive IPCC reports since 1990 project a doubling of CO2 could cause warming of up to 6°C by 2100. Instead, global warming ceased around the end of the twentieth century and was followed (since 1997) by 16 years of stable temperature. • Over recent geological time, Earth’s temperature has fluctuated naturally between about +4°C and -6°C with respect to twentieth century temperature. A warming of 2°C above today, should it occur, falls within the bounds of natural variability. • Though a future warming of 2°C would cause geographically varied ecological responses, no evidence exists that those changes would be net harmful to the global environment or to human well-being. • At the current level of ~400 ppm we still live in a CO2-starved world. Atmospheric levels 15 times greater existed during the Cambrian Period (about 550 million years ago) without known adverse effects. • The overall warming since about 1860 corresponds to a recovery from the Little Ice Age modulated by natural multidecadal cycles driven by ocean-atmosphere oscillations, or by solar variations at the de Vries (~208 year) and Gleissberg (~80 year) and shorter periodicities. 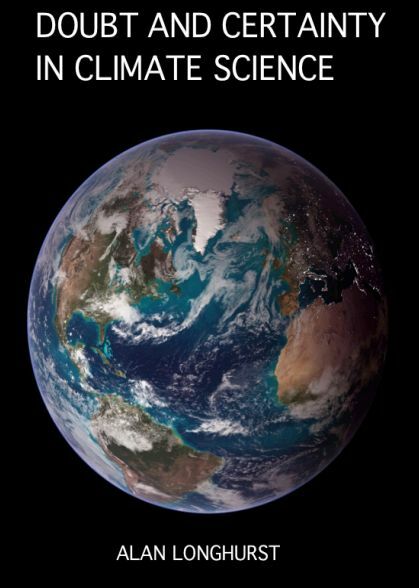 • Earth has not warmed significantly for the past 16 years despite an 8% increase in atmospheric CO2, which represents 34% of all extra CO2 added to the atmosphere since the start of the industrial revolution. • CO2 is a vital nutrient used by plants in photosynthesis. Increasing CO2 in the atmosphere “greens” the planet and helps feed the growing human population. • No close correlation exists between temperature variation over the past 150 years and human-related CO2 emissions. The parallelism of temperature and CO2 increase between about 1980 and 2000 AD could be due to chance and does not necessarily indicate causation. • The causes of historic global warming remain uncertain, but significant correlations exist between climate patterning and multidecadal variation and solar activity over the past few hundred years. 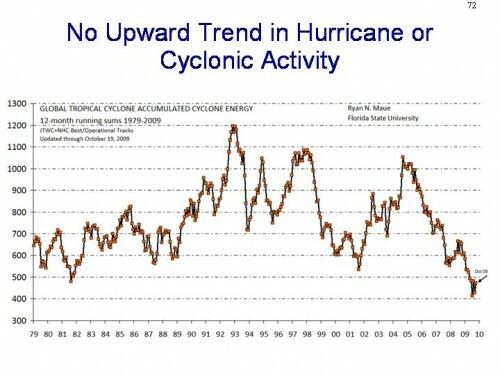 • Forward projections of solar cyclicity imply the next few decades may be marked by global cooling rather than warming, despite continuing CO2 emissions. The current flooding in Colorado may rank among the top 10 floods in the state. Some of the news media are conflating it as a “once in a thousand years” flood. Other media (and Senator Harry Reid ) are saying it is a sign of global warming; for instance see an NBC News report here: “The exact role of global climate change in the deluge is uncertain, but it certainly played a part, according to climate, weather and policy experts.” Policy experts? Those policy experts should pass a law against flooding. If global warming “certainly played a part,” how do they account for the other major floods listed below? I was attending Colorado School Mines in Golden, Colorado, in 1965 and remember that flood. You can read about the 1965 flood details from the National Center for Atmospheric Research here. On the Colorado floods: Over the past few days I’ve been engaged with a lively debate with a colleague over whether it is meaningful to proclaim that the extreme rainfall observed in Colorado several weeks ago are “consistent with” predictions of more intense rainfall associated with human-caused climate change. Motivated by this discussion, I downloaded precipitation records from NOAA for Boulder (here in .dat), which covers a period from May 1, 1897 to August 31, 2013. In the first half of that time period, covering 58 years or so, Boulder experienced 24 days with measured rainfall of 2 inches or more. In the second half of that period (also 58 years or so) Boulder experienced 20 days with rainfall of 2 inches or more. How about really extreme, say 4 inches or more? There is only one data point in the record at that level, July 31, 1919. Now, there is a second. So what is this data “consistent with”? Pretty much anything, and that is the point. Senate Republicans on the Environment and Public Works Committee have issued a 21-page Minority Report entitled Critical Thinking on Climate Change wherein they question the lack of evidence to support the Obama administration’s agenda on climate regulation. “If the computer models and predictions have been inaccurate, why is our federal government relying on these models to take unilateral action?” And the computer models have been very inaccurate, see:More evidence that climate models are wrong. “If global warming has been ‘worse than predicted,’ why won’t the federal government provide the data supporting this claim?” This refers in part to the refusal by the EPA to provide data to justify their regulations. This report is a political document, but then “climate science” is mostly political. The report asks questions that should be answered before any regulations affecting our energy and electricity generation are promulgated.